These free patterns were inspired by quilt patterns. Some are close adaptations of traditional patterns and others are merely reminiscent. Stitch the designs for your favorite quilter, or make your own quilt with floss instead of fabric. Cross stitch each piece individually for small one of a kind works of art or stitch all of them together as a sampler. Add your favorite home spun saying for a beautiful gift or heirloom. There's just something soothing about the combination of browns and blues. This pattern reminded me of an applique quilt. It is not based on a specific quilt pattern. This particular piece looks very much like a stained glass window. It would be beautiful to repeat the pattern over and over again on an afghan or blanket. 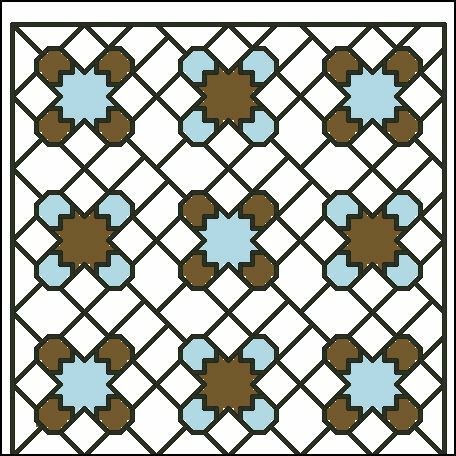 This pattern was inspired by Grandmother Garmon's quilts. The Flower Garden pattern was the one she used the most for making quilts.Did you grandmother make quilts? If so, why not take her favorite pattern and make a sampler piece with her birthday or favorite saying. Free, fun patterns based on the Friendship Quilt Block. Stitch a single block in several sizes and styles of embroidery or stitch the mini quilt (shown here). Use the floss colors I have suggested or choose your own. These patterns were inspired by the Friendship Quilt Block.This would be a great piece to put on a card for your best friend. Having a good neighbor is a wonderful thing. They are there for you, will watch your house, your children and pets. It is wonderful to share the same block with a good friend who will watch out for you. This Good Neighbors Cross Stitch pattern makes a thoughtful gift for your neighbor. You could stitch it up as part of a welcome to the neighborhood basket. Show your new neighbor that you care and welcoming. This would also be good for an elderly neighbor who might not be able to get out as much as they used to. Pair it with a meal and show them that they matter. This pattern was inspired by House Quilt Block. The Hour Glass Quilt designs would make a great addition to a card or gift for a time-ly occassion such as graduation, retirement, or a special birthday.You can pick any color you like. If you want to stitch it just like the picture, it would be great for a patriotic person, or you can do it in school or team colors. This would also look good on an afghan as a repeated pattern, This pattern was inspired by the Hour Glass Quilt Block. These free patterns were inspired by the Maple Leaf Quilt Block. Pattern styles include Cross Stitch motifs, Seasons Change pattern (shown here), and Punchneedle patterns. Stitch the Spool Quilt Inspired patterns with the floss colors of your choice. The design was inspired by Grace's Spools Quilt. The free Monkey Wrench Quilt Collection includes a mini quilt, border and saying based on the traditional quilt pattern. Show off your Cross Stitch! These cross stitch patterns are a perfect way to showcase the complexity and beauty of quilts. You can piece them together for a wonderful sampler or use them individually to create an actual quilt. The possibilities are endless!